Young Stanley Dover secretly has a pet monster. Stanley finds a copy of The Heterodyne Boys Big Book of Fun in his attic, and shows it to his parents. Stanley’s mother Sheila informs him about the Boys: “according to contemporary sources, they were real people, like Doc Savage, or the Shadow.” The demons Remiel and Duma appear, as does the Phantom Stranger, and John Constantine is mentioned. The reference to the Shadow and Doc Savage as real people brings this series into the CU. 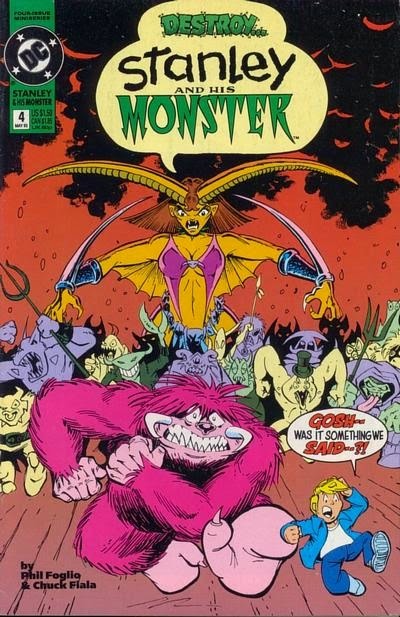 Stanley and the Monster first appeared in comics in 1966, and therefore I have placed this series in 1965. The Heterodyne Boys also appear in Phil Foglio’s comic Girl Genius, which is set in a Steampunk world ruled by mad scientists. Since the Heterodyne Boys seen here are very different than those seen in Girl Genius, it can be assumed that they are those Boys’ CU counterparts. 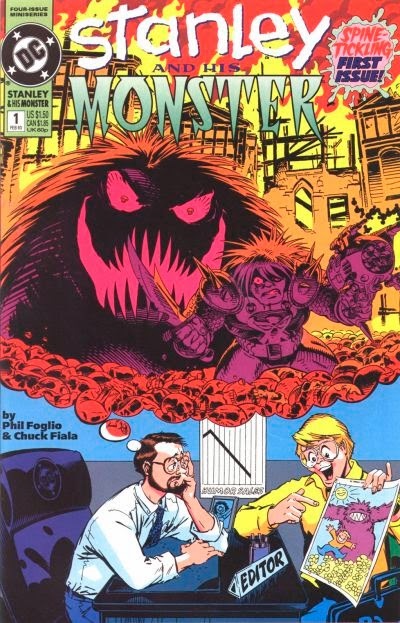 The Stanley and His Monster versions of the Heterodyne Boys also appeared in a Munden’s Bar backup story in the comic Grimjack, further establishing the city of Cynosure (which is a nexus of alternate realities) as being in an alternate dimension to the CU. Remiel and Duma are from Neil Gaiman’s comic book The Sandman. That series has too many strong ties to DC Comics continuity to be included in the CU, so Remiel and Duma must have CU counterparts. It is shown in The Sandman that the Endless exist across the multiverse. The Phantom Stranger first appeared in a comic book that ran from 1952-1953, and was revived in 1969. John Constantine first appeared in the comics in 1984, but there is no reason why his CU counterpart could not have been born and active as an occult adventurer much earlier. Well, you work fast. I mentioned Stanley and his Monster what a week or two ago? Good job. It's worth mentioning that the Phantom of the Opera is mentioned in the Girl Genius webcomic. 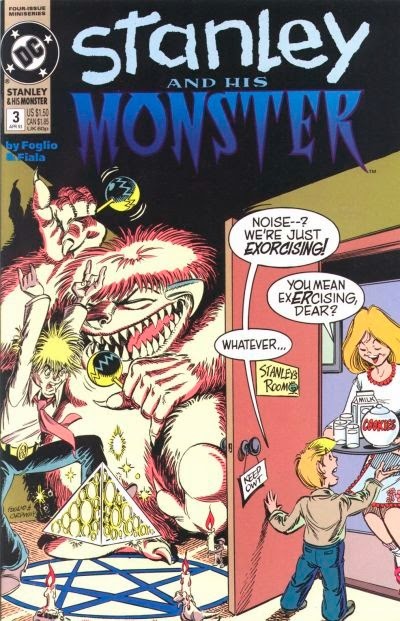 I wonder if this John Constantine isn't relative of the 80's Constantine. I know a relative of Constantine appeared in a Batman Elseworlds story Win included in Crossovers.